The third full-length Earthwork Music release of the Michigan-based roots duo features original Americana music with a few traditional tunes deep with pristine harmonies and imaginative arrangements. The album title, “The Heart’s Swift Foot,” is taken from one of the tracks. Beauchamp says, “There’s a thread throughout the album of the heart, and of love, as a wild, unpredictable force.” Premo adds, “We write about the heart beyond the scope of romance and explore its working condition – how it guides the choices you make and how well they serve you.” Songs on the album touch on making peace, setting aside troubles, navigating closeness, adapting to change over time. 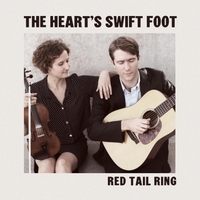 And as in Red Tail Ring’s 2011 releases, “Middlewest Chant” and “Mountain Shout,” the duo moves seamlessly across genres drawing on folk, old-time and bluegrass sounds. Some songs have shades of older forms, such as the conversational back-and-forth of “Katy Came Breezing,” or the banjo-ballad feel of the title track, “The Heart’s Swift Foot.” In other cuts, “Dirt Triangle” and “Body Like a Bell,” traditional structures sidle up next to new musical thoughts. The only two selections not written by Beauchamp and Premo (“St. James Hospital” and “My Heart’s Own Love”) honor the recent passing of two acoustic luminaries – Doc Watson and Hazel Dickens.